The human species has been transmitting radio waves for only about 80 years, so our radio waves cover less than 0.001 percent of the Milky Way. Electromagnetic signals (blue circles shown below) from alien civilizations will continue traveling through the Milky Way even after the aliens are gone. The appearance of a doughnut hole represents when a civilization dies out. Surprisingly, the average number of E.T. signals crossing Earth at a given time should equal the number of civilizations currently transmitting — even if the civilizations we hear from aren’t the same ones presently broadcasting. 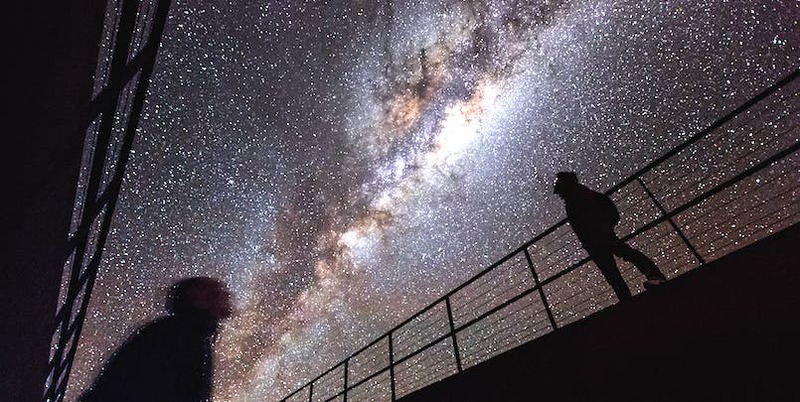 In an effort to update the 1961 Drake Equation, which estimates the number of detectable, intelligent civilizations in the Milky Way, physicist Claudio Grimaldi and colleagues calculated the area of the galaxy that should be filled with alien signals at a given time. If signals from an alien civilization ever reach Earth, odds are the aliens will already be dead.” Grimaldi is now working on a paper about what it means that we’ve found none so far. The team which includes Frank Drake (now a professor emeritus at the SETI Institute in Mountain View, Calif., and the University of California, Santa Cruz), assumed technologically savvy civilizations are born and die at a constant rate. When a civilization dies out and stops broadcasting, the signals it had sent continue traveling like concentric ripples on a pond. Part of the Milky Way should be filled with these ghost signals. If the civilization lasted less than 100,000 years — the time it takes light to cross the galaxy — then the odds of the signals reaching Earth while the civilization is still broadcasting are vanishingly small, the researchers report February 27 at arXiv.org.